In China, you’ll usually wake up to a misty morning. This particular morning, the mist is just that. Not a grey, polluted haze that washes the sky a faded blue, but a crisp, wet fog hanging low over the forest green hills studded all around. Sorry. It’s 7am, and I need a coffee before I start proselytising about the beauty of these ancient Chinese landscapes. Yangshuo, in China’s Guangxi province, does that to you. 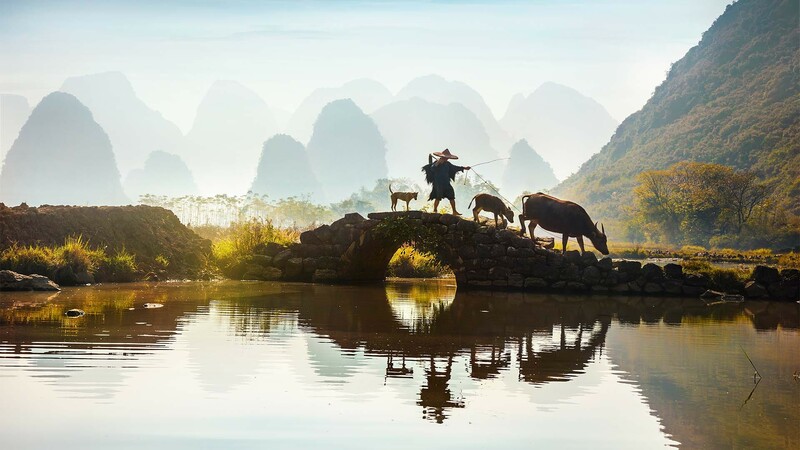 It lines a shallow section of the Lijiang River, surrounded by dramatic karst peaks, watery rice paddies and that wide, blue sky. Look beyond and you’ll see uneven, mossy green hills. Two close together look like a pair of breasts. Sorry, sorry – I’m getting that coffee now, honestly. I’m not here to tell you about how epic the landscape is (although it is pretty epic: the kind of place that makes you realise China isn’t all manufacturing towns, shimmering high-rises and pandas). Instead, I’m going to tell you why the only thing you need to do in this pretty town in southern China is to get your heart rate going. Beginning with rock climbing. Let’s start at the top, which for me is ten metres up the limestone face of a karst. In Yangshuo – the rock-climbing capital of Asia, as everybody tells me incessantly – these hills are called all kinds of strange names. The one I’m currently slithering up is called The Egg (thanks to its conical shape), which is a baby hill for beginners. There’s also Moon Hill, with a large hole in the middle of it (great for abseiling down), Baby Frog and Wine Bottle Cliff, which I’m beginning to hope is the Ronseal of karsts and actually serves the stuff. My arms ache. I might be a long way from the top of The Egg (it’s around 60m tall) but just ten metres up the view over the green mountainous landscape is blockbuster. 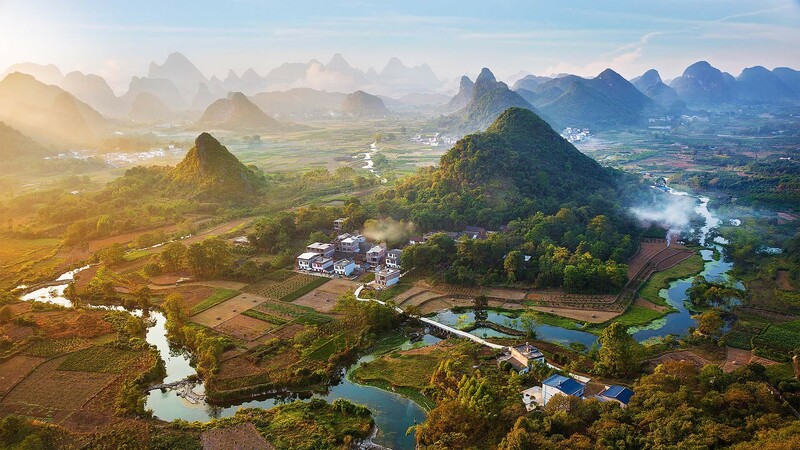 Guangxi’s economy is predominantly agrarian, and it’s crops – mainly rice, maize and sweet potatoes – rather than people that spread out into the near distance. Aniu is from Duyang, a Guangxi town close to the Vietnamese border, and has been climbing here for the past eight years. Now he takes wannabe climbers out for half-day trips – although I only manage a couple of hours before whining that my fingers feel numb (beginners, eh?). Soon we’re back down on terra firma, where the great Lijiang River (the Li for short) bisects the town. 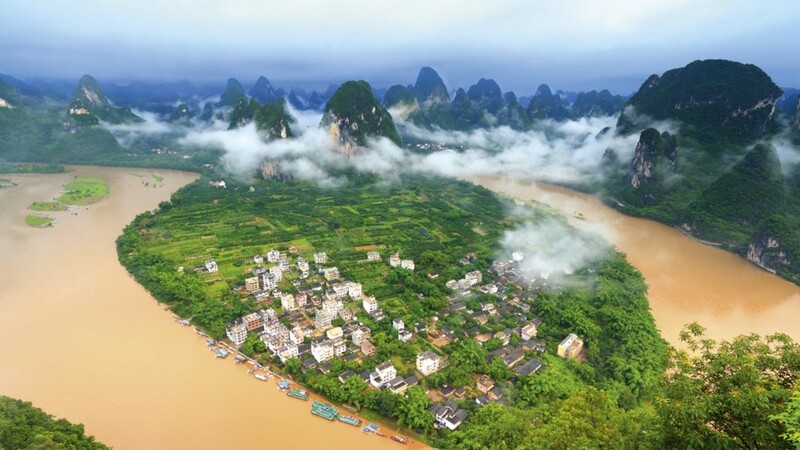 It’s short by Chinese standards: it runs just 83km, from Guilin in the north to Yangshuo in the south before merging with the Lipu and Gongcheng rivers. 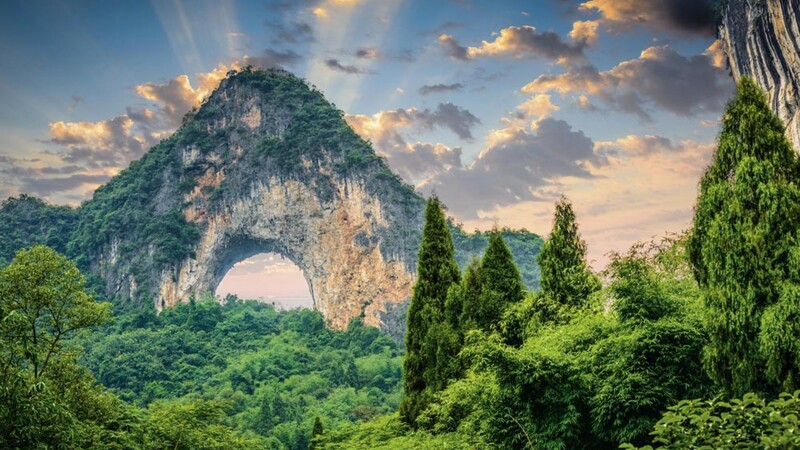 It’s the focal point for Yangshuo tourism. Kayakers, bamboo rafts and bigger air-conditioned cruises putter up and down the water, cruising past the karsts at a slightly faster pace than I struggled up The Egg at. After exhausting energy climbing and pulling my limbs out of their sockets, laying back on a bamboo raft moving just a few miles an hour is ideal. 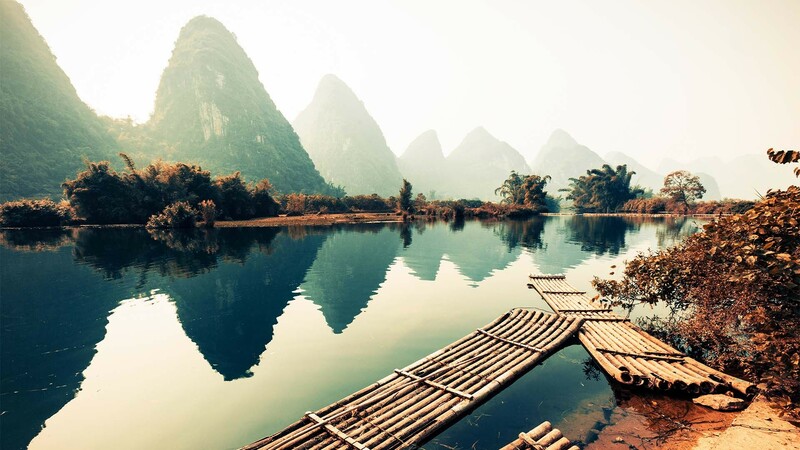 And in the summertime, the Li river is also the perfect place for a secret swim: just pitch up at a slow-moving section and dive in. What do you mean you just cruised down it? After the high-octane stuff, you’ll be wanting low-octane, too: and the place for that is the recently opened Banyan Tree in Fuli Village, a few kilometres out of Yangshuo proper. The village has the unusual honour of being the hometown of painted paper fans (I know), and residents here still follow a very traditional way of life, working in the rice paddies that spread out behind their houses. It’s on the outskirts of Fuli where the upmarket Banyan Tree retreat is sunken into the natural skyline, following the curve of the river. The estate, complete with pagoda and ponds, is home to a collection of low-slung villas, painstakingly decked out in Chinese architecture – think traditional winged slate roofs, low ceilings and lots of dark wood. This place is vast. It’s built with the Yangshuo sunset in mind, which starts around 5.30pm and rinses the sky from blue, to pink, to a deep purple that eventually dips behind the karsts an hour later. Banyan Tree’s rooftop bar just off the lobby is handily located for a grainy snap of sunset, where buy-one-get-one-free cocktails are handily timed. A couple of cocktails later I’m less sure the peaks are breasts. They sort of look a bit more like cat ears. The next morning it’s cycling. Turns out that two wheels are big business in Yangshuo. Locals have half-heartedly tried to insist on some official trails, but really, getting lost in the rice paddies is how to do it. The greenery’s the thing, after all. Fuelled by a jug of margarita unadvisedly drunk at a climbers’ bar on over-populated West Street in Yangshuo town after watching the light show – spotlights shone at the karsts from the river, the ultimate gimmick but absolutely worth seeing – we wheel bikes from Banyan Tree out into Fuli. The wheels are as thick as my ankles. Cycling around the village – unless you want to rear-end a tourist buying one of those painted fans, or rear-end your own forehead bumping over uneven alleyway stones – isn’t really the best place to start, particularly if you’re still running on happy hour cocktails. No, Banyan Tree suggests crossing the Li river on one of its bamboo rafts and continuing up a mountain path to nearby Page Boy Hill (visions of a limestone Little Lord Fauntleroy come to mind). But we’re hungover and obviously know better, so instead take a right out of the Banyan Tree and keep cycling. Two-wheeled disobedience is no bad thing. Some lazy peddling through a series of small hamlets brings us out on an open road that takes us past watery rice paddies with the karsts looming all around. Every time I stop to take a picture, there’s an even better angle up ahead. This game of cat and mouse goes on for about 20 minutes, at which point I decide to stop Instagramming and actually start looking. Such is the joy of being hungover, indecisive, on a bike, around these beautiful hills. Sorry again. I need some water and another coffee. At sunset, it’s time for that other well-known activity – lifting a glass of wine to my mouth repeatedly, with a familiar view to accompany it. Locals call it Mao’er shan. You’ll know it as Cat Ear Mountain.